Wales claimed their first Grand Slam for 27 years by beating Ireland at the Millennium Stadium on Saturday. As well as the prize of a famous clean sweep, Mike Ruddock's players have won many admirers - including Lions coach Sir Clive Woodward - with their brand of attacking rugby. The scenes of celebration have been something special to behold, not just in the stadia but in the pubs and parks as well. Some games went right to the wire, while there was still enough doubt in others to keep tense fans nibbling their fingernails. But in every match there was either one key action or one defining moment that sticks in the memory from each dramatic 80 minutes. Gavin Henson rightly earned the headlines for his match-winning kick with four minutes remaining, holding his nerve to stroke over a longe-range penalty from wide on the right. But it was the Osprey's treatment of England debutant Mathew Tait that really caught the eye. The shell-shocked Newcastle Falcons centre was given a torrid 60 minutes before being replaced. Henson's defence was as spiky as his hairstyle and the image burned in the memory is of Tait being picked up like a rag doll and carried backwards. The red-shirted crowd roared its approval, the other Wales players followed Henson's lead and England were rocked back on their collective heels. It had been the best part of four years since Wales had won away in the Six Nations, but they took little time to get into their stride in Rome. With the confidence of beating England under Welsh belts, there had been little expectation of a loss to the Italians. But the manner of Wales' victory at the Stadio Flaminio - spearheaded by some breathless back play - caught many by surprise. One try in particular had fans and commentators alike purring with delight as the Azzurri defence was shredded. 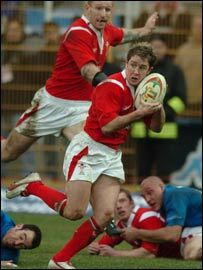 Gareth Thomas launched a counter-attack from deep and as the Wales skipper headed into contact, the ball was popped to Kevin Morgan taking a brilliant line at full pace. Flanker Martyn Williams and Morgan took the move on, before wing Shane Williams produced the killer angle for an outstanding team try. Half-time at the Stade de France and things looked pretty bleak for Wales. The mini-revival looked to be coming to an end after France had run their visitors ragged for 40 minutes. Only some heroic defence kept the score down, with skipper Thomas suffering a broken thumb in the line of duty that would rule him out for the remainder of the championship. 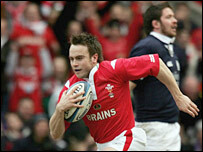 But Wales then staged one of the great recoveries as Martyn Williams grabbed two quickfire tries. The first saw the RBS Player of the Championship continue his brilliant supporting role to ensure Stephen Jones' initial break resulted in five points. But Williams' second, just four minutes later, summed up the speed of thought that had ensured Wales' speed of foot was more often than not applied to the right place. If the Cardiff Blues skipper had hesitated to take the quick tap-penalty for even a split-second, the odds were on him being enveloped by a wave of French tacklers. But Williams took everyone by surprise, including his team-mates, by wriggling through to score a try that incredibly gave Wales the lead. Murrayfield has been the end of more than one Grand Slam chase, and Wales had rarely enjoyed comfortable afternoons away in Scotland. Flanker Ryan Jones gave Wales the perfect start by beginning and ending a counter-attack for the game's first try. But Scotland should have tested those Welsh nerves by hitting back immediately with a score of their own. With a three-man overlap awaiting the killer pass, Scotland fly-half Dan Parks somehow managed to pick out solitary Wales defender Rhys Williams with his pass. The wing intercepted and cantered the length of the field for a try that set the scene for a devastating first-half display. Scotland did come back after half-time but were too far adrift. Who knows what difference an early Scottish reply might have had on the game? Wales had not beaten Ireland in Cardiff since 1983 and now there was the added pressure of a Grand Slam there for the taking. Early signs were not encouraging as Ronan O'Gara put the visitors ahead with a penalty, then Stephen Jones missed an easy reply as the nerves got to the Wales No 10. Henson helped out with a drop-goal to level the scores, but Wales were still struggling to find any fluency in their game. But after 15 minutes of huffing and puffing, Gethin Jenkins blew the Irish house down with a charge-down that changed the whole character of the match. O'Gara took a split-second too long with a clearing kick and found the Wales loose-head prop placing two big paws between ball and blue sky. Jenkins showed pace, composure and no little skill to kick the loose ball ahead, gather and plunge over the try line. Wales surged, Ireland sagged and the rest, as the saying goes, is history.